Friday, August 25 | 6-8:30 p.m.
Eadweard r. York (b. Omaha, Nebraska – Twentieth Century) is an American-born photographer, artist and visionary most noted for his compelling, iconic images of a society on the verge of destruction. Eadweard has constantly pushed the boundaries of conceptual, avant-garde art as an infamous, underground outsider whose distinctive, surreal, pop-punk-dada style is easily recognizable, very powerful, and quite visionary. Eadweard’s legendary art, public-reaction performances, and installations have been quite influential, sometimes confrontational, always at the forefront in the art world. His powerful street photographs documenting the disenfranchised are in stark contrast to the numerous celebrities, bands, musicians and models who have appeared in front his lens, but whether affluent or impoverished, the images are stripped of all pretense and not easily erased from the mind – the work of one keenly aware of the essence of his subject matter. As a young child, Eadweard experienced two opposite sides of life while growing up; one was a sometimes impoverished and chaotic life of moving from city-to-city, school-to-school. The other was a life of being spoiled with love and encouragement from his sweet and cultured grandparents in Omaha. They traveled the world and lived in Europe in the 1950’s. They provided not only the finest essentials in life and encouragement to become a successful artist, but also the exposure to fine literature, culture and art classes he needed to hone his craft. Eadweard’s fondest childhood memories in life were being with his grandparents. Unfortunately, this refuge would be short-lived when as a teenager, bitter estrangement from his parents and miles of distance from the safety of his grandparents would prompt him to look to the streets for survival and subsequently to within himself to fulfill his artistic vision. “As a kid in high school living in Florida, I moved from couch to couch, sleeping on a boat and eventually in a tent in the woods for a while until the tent was stolen and I had nowhere to live. I moved into a wretched punk house with one of my friends and his siblings. It was worse than the house portrayed later in the movie “Suburbia.” Holes were punched in every square inch of the walls that were covered with punk posters, albums and art. We hid everything in these holes, and in the walls behind them. I had to lock my clean underwear and toothbrush in a toolbox as numerous kids routinely crashed there. There was no MTV at this time and only a couple radio shows with cool music. It was a time of Anarchy in America, and this crappy house with the dirty ripped up shag carpet, torn plaid couch and broken kitchen table with thousands of dried watermelon seeds spit all over it mirrored that fact. There was never any food in the house, we had no phone, and the electricity was constantly being shut off. The toilet and bath had scum rings with a fungus-like tree ring growing in it from years of not being cleaned. I took numerous cold showers. This house was the most depressing place a person could have lived in. The only good things about this house were a skateboard ramp we built in a field next door and the music we played. I paid $5.00 a week in rent. When the song “Kids in the Black Hole” by The Adolescents came out, it quickly became our theme song and we played it non-stop because it summed up exactly how we felt – disenfranchised. One day, without telling anyone where I was going, I took everything I owned except my albums and threw it all in the dumpster. I had scraped up enough money for a one-way ticket to California, then eventually made my way back to Omaha. I left everyone and everything I knew behind to straighten out my life and see if I could make a living as an artist. High up in the plane as I flew away from my life, I picked up a radio station on my Walkman playing The Clash song, “Should I stay or should I go?” I had decided to go. It was a very difficult, but smart decision leaving my friends and my life behind. They never heard from me again and I never looked back. Since I was a kid, I had been doing art, studying architecture and writing music. I fell into photography and film entirely by chance. I was 19, living in Omaha and working as a waiter at an Indian restaurant. The chef who was from Bhutan asked me if I wanted to try out his new Nikon camera. I told him I had only taken a few Polaroid’s and knew nothing about cameras, but I’d always wanted to try shooting photos, so I took a couple rolls of black and white film on the street – some homeless people and faces of interesting characters. Several days later, a friend came into the restaurant to have dinner with her friend David Radler. She mentioned to him I was an artist and told me he was a fashion photographer from LA who just returned from Italy to do some fashion shoots in Omaha. I told him I had just shot my first rolls of film and asked if he would take a look at the contact sheets. He looked at my contact sheets and said, “Would you like to be my assistant?” The reaction was entirely unexpected. I didn’t know what to say, so I asked if I could give him a call. The next day I went to the library and checked out every book on photography they had and read them all and two weeks later I became his assistant. After a couple years as an assistant, I became the chief studio still-life photographer. I shot hundreds of ads, models and catalogs. “The Museum of Cheap Art” became an infamous venue for radical experimental art – a hangout for “The Destructionist Art Movement” led by Eadweard, poets and avant-garde musicians who influenced the underground, independent Omaha music scene. It soon attracted a reputation as a cutting-edge art gallery, most notably as a result of hosting an exhibition of the world-famous, notorious “Scherzkopf.” The exhibition opened to rave reviews and international interviews, before the press discovered that the artist Scherzkopf had been entirely fabricated by Eadweard. “For a few years, I had been secretly working on experimental photographs while working as a photographer. Late one night, while sitting at Omaha’s Leavenworth Cafe, I created Scherzkopf (Joke Head) as a conceptual assault on the elitist art scene and as a tribute to Marcel Duchamp. The German anti-artist, Scherzkopf was a friend with Joseph Beuys, Andy Warhol and Anshelm Kiefer. His resume included exhibitions at The Museum of Modern Art in NYC, The Institute of Contemporary Art in London, Wallraf Richartz Museum, and The Walker Art Center in Minneapolis. Scherzkopf was also, incidentally, the stepson of the important surrealist Max Ernst. “AmerWrecka” – In all this madness, I’ve seen untold beauty. The book was first conceived in the mid 1980’s while I was living in Omaha and working as a commercial photographer. I had originally used “AmerWrecka” as a graffiti tag I spray-painted on condemned buildings around town. The photographs from this book include my “Walk-By,” “24th and Leavenworth,” and “Cairo” series, which were taken from 1982 to the present. 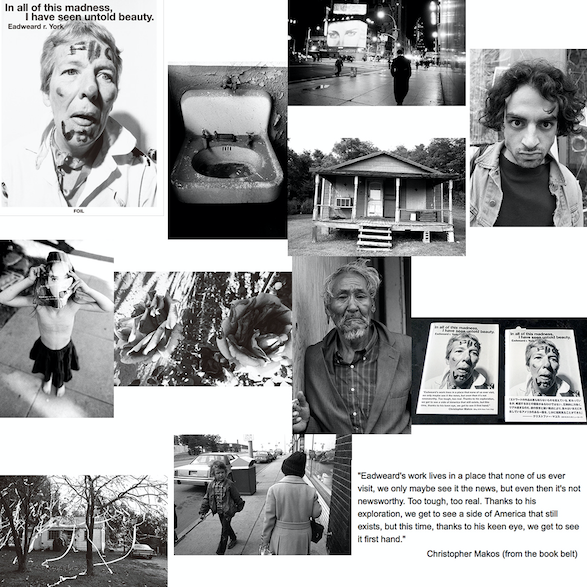 They are a historical perspective of America through my lens, a documentation of my life and what I have seen. Having grown up in the punk rock movement, I was a product of my environment, so naturally inclined to look at things from a different perspective and document them in a way that wasn’t being portrayed by ordinary photographers at the time – much like Dorothea Lange and Walker Evans had done during the Great Depression. I don’t look at my photographs in a negative way, as I find great beauty in photographing the decay and destruction of old houses, buildings, cities, people and faces. I’m not interested in portraying the positive image of American life that is broadcast non-stop by the Hollywood media machine, whose only real interest is to sell the world a commercial depiction of reality. I am only interested in portraying the truth in history, from the perspective of a street photographer – whether that be shooting the inner city homeless, a walk-by or anything that happens to catch my eye. My “Walk-By” photographs were experimental. I wanted to see what kind of image I could produce by taking photographs at random without looking at the subjects through the viewfinder. When I see an interesting subject approaching me while walking around, I set my exposure, estimate my focus and take the photograph. I am trying to capture a “feeling” and I have never really been too concerned if the image was in or out of focus as its end result. When it comes to light, I have been intrigued by light since I was a child. The streetlight outside my house would shine through the windows at night. The stark contrast of the images of the trees and branches moving with the wind on the walls actually scared me. This had a lasting-effect and I believe it has been a direct influence on the way I look at light and the way I use light in my photographs when I am in the studio. As a musician, his notorious anti-art band, “Neubach Chaotic” released several cassettes in the 80’s – 90’s and has a track of noise music on LA radio station, KXLU’s “Demolisten” series alongside musician, Beck. The book was Design by Yoshinori Ochiai（Garage Ltd.) who has designed some really great Art books. The Book Was Just released, and is in All The Major Japanese Bookstores in Tokyo, Osaka, & Kyoto.